I wish Walmart had scent descriptions to read on their website for all the different fragrances they carry. I like reading those… it helps me break down what I think I’m smelling sometimes. Vanilla Caramel Spice smells sooooooooo much better melting than it does cold. All that warm and creamy vanilla goodness comes out along with the perfect touch of cinnamon. I love vanilla scents and this one is really deliciously creamy and wonderful. I still wasn’t making out any caramel notes but I was perfectly fine with that. This scent was all vanilla cream. Mmmmmm!! Strength – this gave a nice medium/strong throw. I used three cubes each in two melters and the scent saturated my entire great room. LOVED!!!! In closing… if I find this scent again at Walmart, I’ll for sure purchase multiples of it. LOVED! 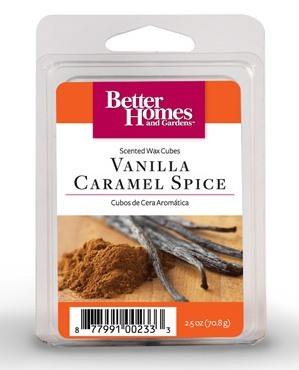 Have you tried Vanilla Caramel Spice from Better Homes and Gardens? Review it with us. It’s easy… simply write your review and star rate your experience in the comment section below. The fall fragrance of cinnamon and vanilla.